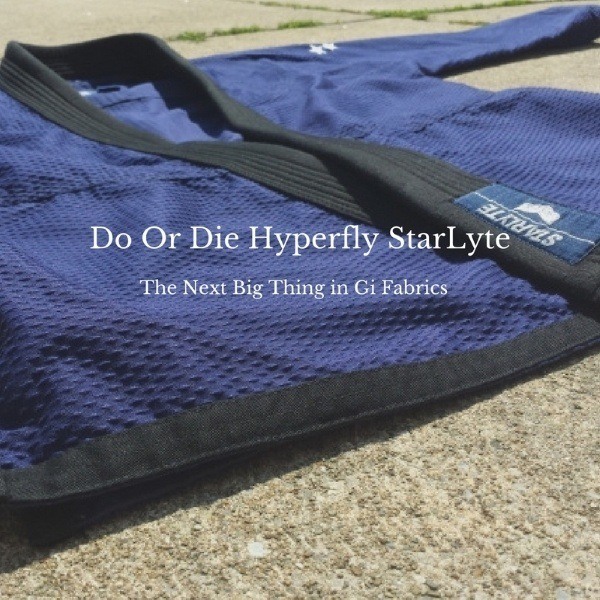 One of the hottest and most active companies on the gi market, Do or Die Hyperfly has established themselves as a constant innovator, putting out high quality attractive product with simple yet iconic designs. We had the special privilege of getting to review their brand spanking new StarLyte gi ahead of its release. This Gi was submitted to me free of charge (by way of gireviews.net) for review. I have never done any work with or for Do Or Die Hyperfly. I’ve been a bit of a fan boy of Hyperfly for a while. 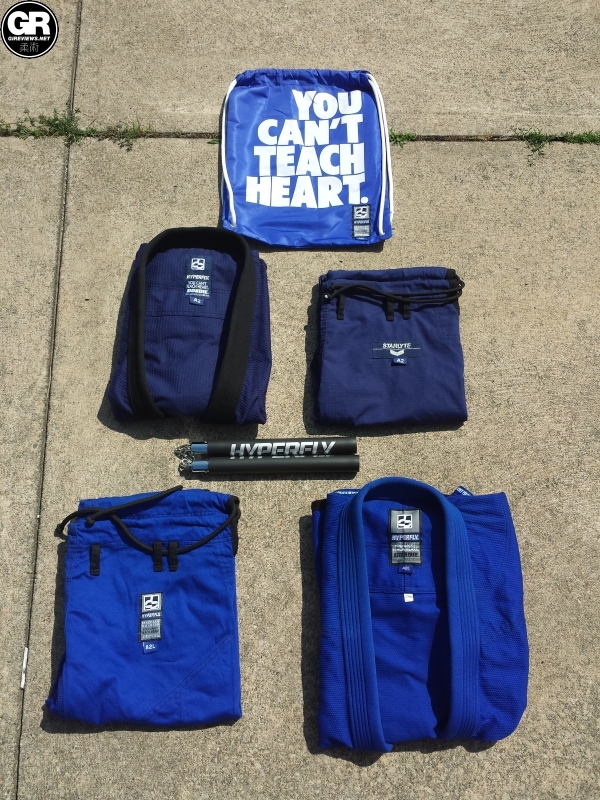 I’ve always loved the “You Can’t Teach Heart” motto and I love the clean designs and fabrics that for which Hyperfly has become known. Back in August I got word that I would be receiving two gis, one standard Hyperfly Premium gi as well as an as of yet unreleased product. I was informed that the fabric is not one that is currently used in jiu jitsu uniforms, and that the gi I would be receiving is truly a special product. I received both gis on my birthday (an awesome birthday present) along with a pair of Hyperfly’s foam nun chucks. Both products looked stunning fresh out the packaging, and I will release my review of the Premium gi at a later date. I am releasing this review a bit earlier than normal, though I did wear the gi over the course of 2 months around twice a week. I’m 6’1, 195. The size that tends to fit me best is A2L. This StarLyte is an A2, but the dimensions are fairly generous for an A2 so the gi fit me decently. It was a touch snug in some places but I have no real overall complaints about the fit given that it’s just an A2. Hyperfly did this gi right. The model I received is navy blue with black accents. The rip stop trousers are simple as well, navy blue with some black trim and seam tape. The symbols on the gi are par for the course for Hyperfly. On the jacket: one arm has a Hyperfly crest on it with StarLyte written on it, the other arm has 5 stars on it. The bottom of the lapel has a branded patch as well. The pants only have one small branded patch. The jacket of this gi is a work of art. The fabric doesn’t stretch when wet, and absorbs sweat more similarly to a standard gi material than rip stop. At a closer look at the fabric is thin with small woven diamonds throughout. These diamonds serve as both reinforcements as well as points for generation of irritation to a hand trying to grab the gi. The inside of the gi is remarkably soft and comfy. The black twill covered foam lapel is thick and supple like a standard weight Hyperfly gi. The gi breaths amazingly well because the fabric is so light. However because of the thicker points in the fabric it has a substantial and dense feel to it. The trousers of this gi are far less complex and impressive than the jacket. They are a soft, lightweight and comfortable. I have no complaints about the pants. The trousers have a black stretchy rope and 6 black loops. For starters the gi is as comfortable as the softest gis I’ve worn. It feels great to roll in. The exterior’s weird roughness makes it very difficult to retain grips. I love it! My only concern is that it may almost become a crutch to the wearer. It gives you such a big advantage because of the difficulty of grip retention and if it’s not legal for bigger competition (which at least this model won’t be because of the difference in lapel and body color) will actually serve as a long term disadvantage. But seriously, this gi is a blast to roll in. I highly recommend it. Do or Die Hyperfly did something special with the StarLyte gi. I’ve never seen anything else like it, and it is just so much fun to wear. It also happens to look incredible which doesn’t hurt. You can pick this gi up at www.doordie.com once it’s released.